The 13th National Award for Research in Sports Medicine, awarded by the University of Oviedo and sponsored by Cajastur for the best research work in 2010, has been given to the work presented by the IMIM (Hospital del Mar Research Institute) in Barcelona. The work, directed by Dr. Jordi Segura, director of the Anti-Doping Control Laboratory at the IMIM (Hospital del Mar Research Institute), included the collaboration of Dr. Rosa Ventura, Mrs. Núria Monfort and German research centres in Bochum and Cologne. According to Dr. Segura, this work enables them “for the first time ever to tackle the detection of all types of blood transfusions, including autologous transfusions which were undetectable until now”.Autologous transfusions consist in storing the athlete’s own blood and re-introducing it again a few hours before the competition or intense phase. Evidence suggests that this prohibited practise is one of the greatest problems in sports nowadays. 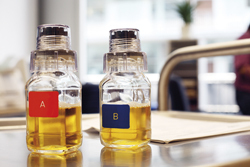 The award-winning method is based on testing urine for the presence of metabolites of the plasticisers found in the bags used for storing blood or packed red blood cells. These substances pass into the blood contained in the bags, as they are fundamental for stabilising the membrane of the red blood cells and, as a result, penetrate the recipient's body in large quantities. The transfused individual passes them out of the body as metabolites in their urine within a couple of days. Despite the fact that all of us pass small quantities of these metabolites out of our bodies because of environmental exposure to other plastics, the quantities found in transfused subjects are much higher than usual ones. “In addition to enabling us to tackle a matter which has been unresolved until now, the fact that this methodology is based on urine, which is always collected in anti-doping tests, makes it applicable to all tests which are performed nowadays. It could even be applied retrospectively to previously stored urine samples” the researchers said. The application of this methodology for penalising athletes is pending the results of additional studies which will enable any factors which could cause confusion in the correct interpretation of results to be ruled out. “Nevertheless, the method could already be used to show which athletes have not undergone a transfusion and therefore verify that the majority of these are competing without resorting to the aforementioned prohibited practises”. The possibility of verifying that these athletes are clean is considered fundamental for strengthening social credibility in the clean state and image of the majority of sporting victories. Dr. Segura points out that “Just as important, or more important than showing who’s guilty is reinforcing who’s innocent”. “Plasticiser Metabolites in Urine, the Key to Detecting Blood Transfusions”. Jordi Segura, R Ventura, N Monfort, P Platen, T Hinrichs, K Brixius, W Schänzer, M Thevisy H Geyer.